Bald spots, tails with mohawks, and assorted lumps and bumps … all of these symptoms can be signs of an itchy horse. Unfortunately, all the symptoms of horse itch are usually worse in the summer, when bugs, humidity, and heat all contribute to the problem. Does your horse itch? If so, then you know it is very difficult to watch your horse rub himself on every post, tree, and shrub. An itchy horse feels bad, and watching an itchy horse in action can make you feel even worse. So what can you do as a responsible horse owner to help your itchy horse feel better? Horse itch can be one of the most difficult health problems to cure, especially if symptoms are already full-blown during the middle of the summer. The situation gets even more complicated if you want to avoid constantly spraying your horse with chemical sprays. Luckily, there are 5 steps you can take to alleviate the symptoms right now, while at the same time supporting your horse’s immune system so that symptoms will be much improved next summer. When a horse is itching madly, his system is totally stressed, which means his immune system can’t work effectively. To restore his immune system to full functioning, you need to first take care of his stress. Herbal supplements that relax his whole system work well. Two supplements that seem especially helpful are RelaxBlend from Equilite and Eleviv from XanGo. Both of these supplements keep inflammation at a minimum, plus they keep your horse mentally cool and calm. Other calming herbs to consider adding to your horse’s daily regimen include hops and lobelia. If you horse itches all over, topical solutions applied daily are a good bet for giving your horse immediate relief. For instance, DRAW Formula is a multi-mineral liquid that you can sponge all over your horse to relieve the itch. Simply dilute DRAW with water and apply daily. Spraying your horse with a mix of Avon Skin So Soft, water, and apple cider vinegar also helps keep the flies away. If your horse has specific itchy spots, you can apply ichthammol or Hyper-Cal to individual areas. While this option seems obvious, many horse owners overlook this simple solution. Covering your horse with a mesh fly sheet with head/neck attachment will help if your horse’s itchiness is caused by fly or insect bites. Many vendors now also offer mesh leg coverings, since flies tend to gather around your horse’s legs. While covering him in this way may scare off his pasture mates, your horse will feel much more comfortable. In addition, you won’t need to spray him constantly with chemical fly sprays. Another solution for itchy horses reacting to fly and insect bites is to add supplements to his feed. Substances like garlic and apple cider vinegar both work well. Equilite’s Garlic Plus C works well for many horses, and most horses find it palatable. This combination includes garlic and Vitamin C, plus chinese herbs, astragalus, and schisandra with a touch of zinc. As a bonus, it also works well on other skin conditions like fungus. For the most part, a horse has itchy skin because his immune system is not strong enough to overcome environmental factors, such as insects or allergens. One way to support your horse’s immune system right now, plus prepare his immune system for next summer, is to start him on a foundational nutritional program now. Good options include blue-green algae, probiotics, enzymes, and antioxidants like wheat sprouts and coenzyme Q10. One combination that works well is the New Earth Essentials mixed with XanGo mangosteen juice. Feed a lower maintenance dose this summer and through the winter. Just before next summer, increase the dose to combat the heat, humidity, insects, and allergens. For instance, you might mix 750 ml of mangosteen juice with 7 packets of Essentials. Feed an ounce per day of this mixture as a maintenance dose. Starting in the spring, increase the dosage to three ounces daily. You may not see much difference this summer or this winter, but next spring you will definitely see a major difference in your horse. He will itch much less, and have a much stronger immune system. Watching an itchy horse in action is one of the worst things a horse owner can bear. However, if you are diligent in supporting your horse’s entire immune system as well as alleviating symptoms in the short term, you should see permanent results in six to nine months. As with everything in holistic horse care, progress is slow when compared with conventional medicine. However, solutions are also more permanent and lasting than those offered by allopathic medicine. My advice? Stick with a holistic program and be patient … you will see positive results! Need Support for Your Itchy Horse? They say that “it takes a village” to raise a child. I say that it takes a village to cure some horses of chronic health issues. Just check out my blog to see the struggles I’ve had with Bud, one of my resident patients. Sometimes I just want to pull my hair out because he can be so difficult to treat. So I know how hard it can be for horse owners to care for horses with chronic health problems. It does take a village. Well, if you feel like you need a village to help your horse recover from some health problem, we have one. It’s called the Horse Health Hotline. 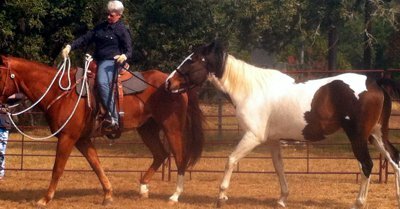 This online forum is filled with people who are caring for their horses holistically, and having real successes. The health issues discussed on the forum range from laminitis and insulin-resistance to itchy skin and COPD. The solutions offered include nutritional supplements, flower essences, homeopathic remedies, essential oils, acupressure, barefoot trimming, and much more. Read the forum at no cost or join for just $40 for a lifetime membership. You will be amazed at what you find in this information-rich online resource!